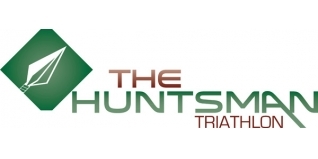 This will be a first in my triathlon history covering 20 years of racing. 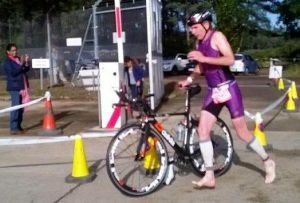 I was going to try to race my third triathlon in three weekends. The mind is willing but would the body hold out? We had to get up at stupid O’clock (4am) & travelled to Hawley Lake, which is just past Fleet Services on the M3, in an Army Barracks. I have never done this course before so we had arrived in plenty of time to drive around the bike route, admittedly in the dark, but it gave me a rough idea of what the course was going to be like. After doing the reccie, we arrived at said location just as dawn was breaking which revealed quite a nice lake. I then registered & racked the bike & did a reccie of the first 500mtrs(ish) of the run course – more on that to follow later in this report. There were three waves & I was in the second wave. The first being the Sprint distance guys & the remaining two were the Olympic distance athletes. Obviously as I am now an old fart I was put in the slow group!!!!! The swim was a deep water start. They said that it was 17 degs but I didn’t agree with that. It was a two lap anti-clockwise swim & the starter counted us down from 10 but I decided to go on 1, just to get a little head start. But that didn’t last long as a few quick swimmers in my wave overtook me. Other than that the swim went really well, apart from getting a bit cold in the last part of the swim. Into T1 for a quick transition where I managed to overtake a few in transition, then out onto the two lap bike course. The first part of the course had quite a good quality climb & I managed to get up it in the big ring then off around the country lanes. I was being a little bit cautious on the corners & the roundabouts due to the roads still being a little bit wet from the overnight rain. Nearing the end of the first lap on another one of the climbs, a couple of roadies started playing “lets overtake the triathletes” & then slow down which was a little annoying but it also made me go a little bit faster to drop them. Back down the steep hill past the entrance into the barracks to start lap 2 & it was nice Coach 2 waiting there. I didn’t manage to get up the hill on the big ring for the second time though. By this time there were more competitors on the road to overtake so it wasn’t as lonely as on the first lap. Back into T2 for another quickish transition because of cold feet & then out onto the 2 lap run course. This was a mixture of country trails, tarmac, two very steep hills, the first one being about 200mtrs around the corner from me doing my run reccie in the morning so that was quite a shock to the system. Yet again the first lap was a little bit lonely but I just managed to do my own thing & then lap 2 there were more people to chase down. It did seem like a very 10K but my previous two races were completely pan flat, but I did enjoy the challenge. Conclusion: I have really enjoyed this season, which consisted of 12 triathlons (5 of these were Sprint Distance & one of these was the European Championships) & I podiumed in 9 of them in my age group, plus a podium at the Winchester 10km, so all in all, I am very happy with how this season has gone. Roll on next year.